Compound microscopes are divided into two major categories depending on the type of sample and the light path used to examine it. Typical biological microscopes are designed to look through the sample, with the light shining up through the specimen - this is referred to as diascopic illumination. The samples are very thin and transparent or translucent. Opaque specimens are examined with light from above the sample that is reflected back - this is referred to as episcopic illumination. These samples are viewed with metallurgical microscopes in metallurgy, engineering, manufacturing and other industrial applications. The objectives for these two categories are distinct and are marked on the barrel of the objective. The objective shown below is for reflected light. The BD indicates that this microscope objectives is intended for brightfield / darkfield illumination, a standard technique in reflected light microscopy. (BD reflected light objectives also usually have a larger thread mount and barrel to accommodate the additional light path. These lenses will not fit the standard nosepiece). 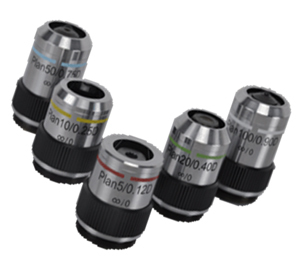 EPI indicates that this microscope objective is used for epi-illumination. Immediately after the infinity symbol there is "/0" - this means the objective is intended to be used without a cover slip. This is also the main difference in the design of reflected light microscope objectives. Biological objectives, unless noted NCG (no cover glass) or water immersion, will be designed to include a cover slip between the specimen. After the infinity symbol the marking usually will say "/0.17" - this is the standard thickness of a cover slip. 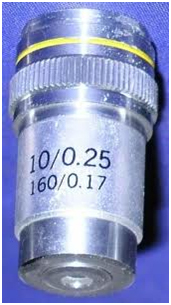 If using a fixed tube length system, the markings will show "160/0.17" or "170/0.17". If the sample has no cover slip it will not be noticeable at low power of 4x and 10x. However, at 40x and above this 0.17 is crucial and the resulting image is very poor without the cover slip in place. A fixed tube length microscope objective. There may be a few applications when these objectives cross the line. So keep this in mind if working with a non-traditional sample.